There is fishing line available today for nearly every situation bass anglers will encounter. You now have the option of trying monofilament, fluorocarbon or braid, so you have to decide which type of line is best for your style of fishing. The best multipurpose line is monofilament. It has been an all-around great bass fishing line for years and is affordable. Monofilament has more stretch than fluorocarbon or braid so it is ideal for running shallow-diving crankbaits through wood or rocks. When the crankbait hits an object the extra stretch in the line helps the lure kick off of the cover better. Monofilament is also best for working suspending stickbaits because the line floats and allows the lure to hang in the strike zone longer. Fluorocarbon absorbs water and tends to sink which affects the buoyancy of the suspending lure. Its buoyancy also makes monofilament a good choice for topwater fishing applications, but braided line is preferred for making long-distance casts with surface lures. Although you can cast your topwater lures farther with monofilament, throwing surface lures such as buzz baits and plastic frogs on braided line is the best option because it floats well and has better hook-setting power since it has low stretch. Braided line’s low stretch also comes in handy when fishing spinnerbaits and lipless crankbaits through milfoil and hydrilla beds. You can rip these lures through the weeds easier with braided line which triggers more strikes. Braid is also favored by the pros for punching Texas-rigged soft plastics with heavy weights through thick vegetation mats. The sensitivity of fluorocarbon makes it the top choice whenever you use lures that require plenty of feel, such as worms, jigs and Carolina-rigged baits. Braid is also sensitive but fluorocarbon is more transparent than braid which is critical when fishing in clear water or when using a finesse bait that bass come up and examine. Fluorocarbon also is ideal for running deep-diving crankbaits because the line’s ability to sink increases the depth of your lures and its low-stretch qualities improve your chances for a better hookup. 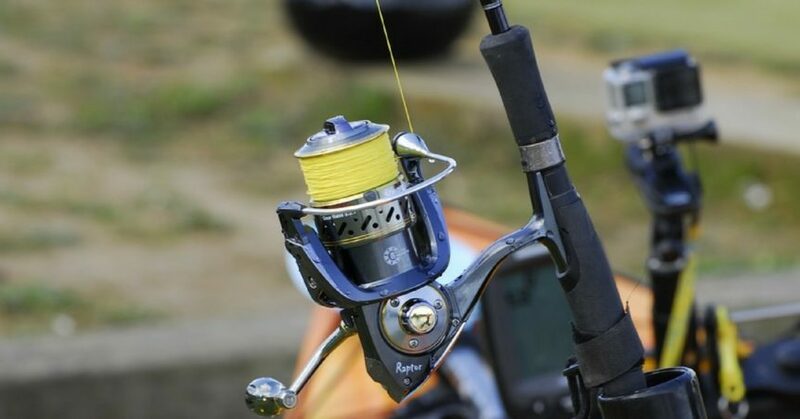 You can easily fill your baitcast reels with all three types of lines, but fluorocarbon’s stiffness makes it tough to spool on a spinning reel. The pros solve this problem by filling the reel with a main line of heavier braid and tying a 10- to 12-foot leader of lighter fluorocarbon with an Alberto or double uni-knot.